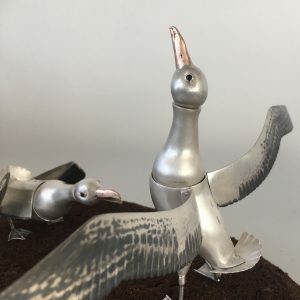 My Albatross sculpture is based on wandering albatross, biggest seabirds with longest wingspan(can reach 3.5m) of any birds. Most of 14- 22 species are threatened/endangered. In the past they were hunted for feathers and oil, but today are affected by pollution, overfishing, introduced species and entanglements by fishing gear. albatrosses can fly long distances without flapping the wings using technique called dynamic soaring. They mature slowly after about 5 years but they do not begin breeding another a few years. After fledging they do not touch the ground until they return to the island to breed. Most of the species live in South hemisphere, but there are 3 central Pacific species. One of them short-tailed albatross ‘Shorties’ breed on Southern Japanese island of Torishima. In the late 19th century, Japanese entrepreneurs discovered this and killed millions of the birds for their feathers and oil. By the Second World War, the Shorties was judged to be extinct. The last few immature Shorties were out over the open Pacific, oblivious that rest of their species was being battered into extinction. The young adult Shorties eventually returned to Torishima and started to breed in 1951. This minuscule number gave rise eventually to a flame of hope. In 2018, there are estimated 5,000 Shorties.